What “Christmas Shoes” Means to Me « Midlife Crisis Crossover! Guess which ones are mine and win an MCC No-Prize! No, not the song. Egad, no. No no no no no. Once again it’s the season for family making the visitation rounds for the sake and spirit of Christmas. Our largest family gathering every year is at my father-in-law’s place, where this year over three dozen relatives and plus-ones convened on Saturday morning, though just to brag for the record, Anne and I were among the three (3) people who could be bothered to arrived on time. One of the major house rules is shoes come off at the front door, because older couples who think white carpet is a splendid decorating choice are finicky that way. By the time everyone arrived and got down to eating and mingling throughout the afternoon, the entryway was a cluttered war zone of castoff footwear. No heels, no Manolo Blahniks, nothing you’d wear to a shoeshine stand. Neither our families nor our gatherings see high rollers like that. Anyone who would object to such carefree shoe storage would be recognized right away as Not One of Us. And yes, I see you number-crunchers out there scrunching your nose because you count two dozen pairs at most in the photo. Several more pairs were offscreen to my left. It’s also possible that a few of the toddlers were allowed to keep theirs on. I wouldn’t know. I wasn’t looking because no one assigned me to Christmas Shoe Police duty. 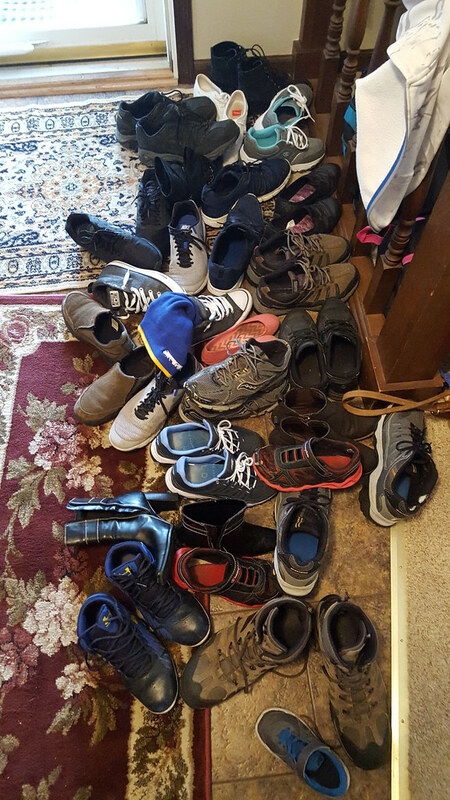 The shoe pile is emblematic of our gatherings themselves, whether it’s holidays, kids’ birthday parties, or the annual reunions where we’re joined by a few extra strangers of shared blood. Everyone who’s a citizen of our tiny microcosm nation agrees to throw in together and make one big mess. At the end we agree to retrieve the parts of the mess that were our fault, one by one, family unit by family unit, until order is restored and my in-laws have their foyer back. It’s Christmas. It’s what we do. In our finer moments it’s how we can be as a family in other matters as well. Merry Christmas to you ‘n’ yours from us here at Midlife Crisis Crossover. May your days be merry and bright, may your celebrations of our Savior be blessed and comforting, and here’s hoping the circles you belong to will set aside their reservations and come together in happy, sloppy, love-filled pileups of their own. Clever thinking! But no, I complied with the order. Best wishes to you too. Are those brown boots that form a v yours? You’re close in a sense, but they’re not.